While unemployment appears to have reached average Western levels, the more relevant concept for Israel is “non-employment.” Among Israeli men, rates of non-employment have risen far above those of advanced Western countries. For many years, unemployment rates in Israel were higher than the Western average. Even before the recession of the early 2000s, the unemployment rate in 2000 – a year of prosperity in Israel – reached 8.8 percent, compared with 6.1 percent on average in the OECD (the Organization for Economic Cooperation and Development – an organization composed of the world’s industrialized countries). With the outbreak of a major wave of terrorism and the concurrent onset of a deep recession during the first years of the past decade, unemployment in Israel reached 10.7 percent of the civilian workforce. Since then, unemployment rates began falling toward those of OECD. 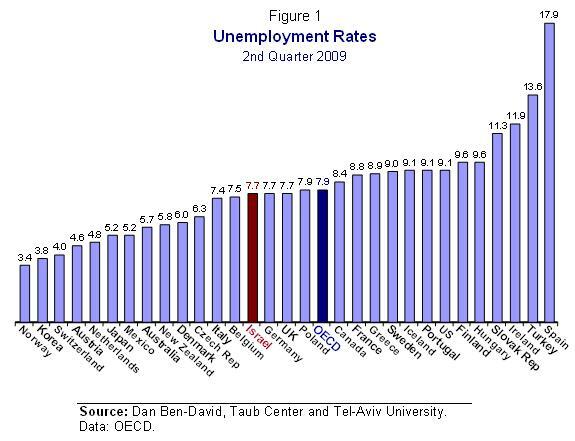 In 2008, unemployment rates in Israel were almost equal to the OECD: 6.1 percent in Israel and 5.9 percent in the OECD. As the world entered the recent recession, the picture was reversed. By the second quarter of 2009, unemployment rates in Israel fell below the OECD average for the first time in decades: 7.7 percent in Israel versus 7.9 percent in the OECD (Figure 1). In fact, unemployment in Israel was lower than in most OECD countries, even as some of the latter reached double-digit unemployment rates – up to 11.9 percent in Ireland, 13.6 percent in Turkey and 17.9 percent in Spain. While Israel’s rate of unemployment is currently similar to that of the OECD, it does not follow that the employment rates of the working-age population are also similar – and here lies the main problem of Israel’s labor market. A very large share of Israel’s working age population does not participate in the labor force. 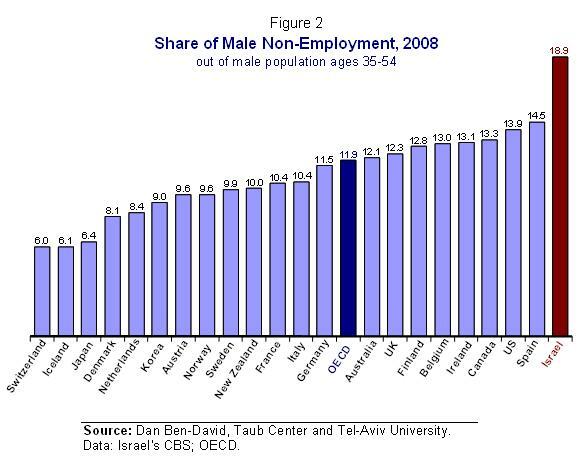 Therefore employment rates in Israel are very low. Figure 2 shows rates of non-employment of men aged 35-54 in Israel and most OECD countries for 2008 (because of mandatory military service, many Israelis are still in college into their mid to late twenties, hence the focus here is on 35-54 year olds). While unemployment rates are based only on those who participate in the labor force, rates of non-employment reflect the ratio of all non-employed – whether the individual participates in the labor force but is unable to find a job or does not participate in the labor force at all – for the entire prime working-age male population aged 35-54. Whereas non-employment rates in the OECD fluctuate around an average of 11.9 percent, the corresponding rate in Israel reached 18.9 percent. Even Spain, the unemployment leader in Figure 1, is far below Israel in rates of non-employment. Who is not employed in Israel? Conventional wisdom is that the issue begins and ends with the ultra-Orthodox Jews (haredim) and Israeli Arabs. Rates of non-employment among these population groups are indeed high. However most of Israel’s population is neither haredi nor Arab. 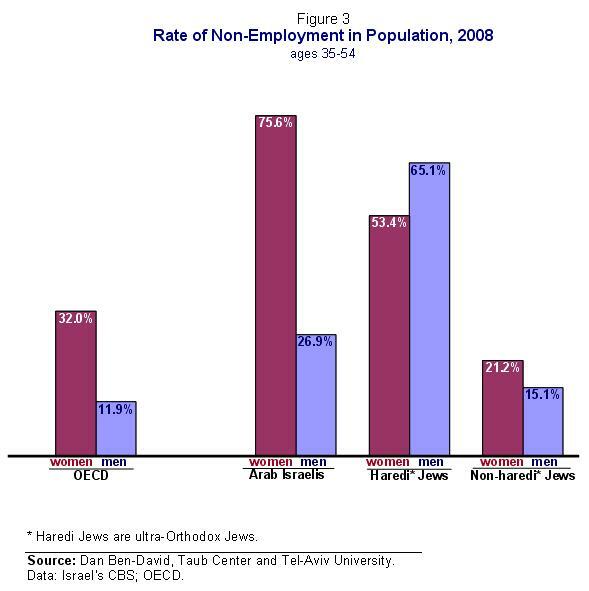 As shown in Figure 3, even after controlling for the two groups, the 15.1 percent non-employment rate among non-haredi Jewish men is still higher by over one-quarter than the OECD average rate of 11.9 percent. This reflects a substantial difference between a large part of the Israeli society and much of the West in the ability to cope successfully in a modern and competitive economy. The picture differs considerably for non-haredi Jewish women, where the 21.2 percent non-employment rate is considerably lower than the 32 percent average for women in OECD countries.